* Our enthusiasm for starting our child patients on the path to a lifetime of good dental health, with beautiful straight teeth. * Our belief that all ordinary children, even those with previous unpleasant dental experience, can learn to be good dental patients, without the need for pharmacologic behavior management (i.e., no sedation). For very young children with early extensive childhood tooth decay, and for some older special needs patients, we sometimes choose to work with a dental anesthesiologist . 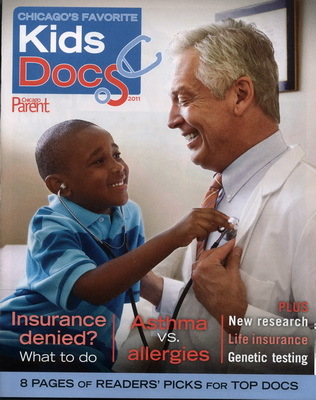 * Dr. Crawford's unique status as a "Dual Specialist", with certification in both Orthodontics and Pediatric Dentistry. Many of our young patients, with some early orthodontic treatment, significantly reduce, or sometimes even eliminate, their eventual time in braces. Every child's checkup includes an orthodontic assessment, so that treatment timing can be optimized. 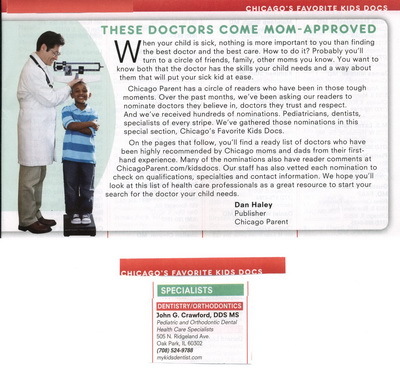 Dr. Crawford was named one of the top three children's orthodontists in the Chicago area by Chicago Parent magazine!